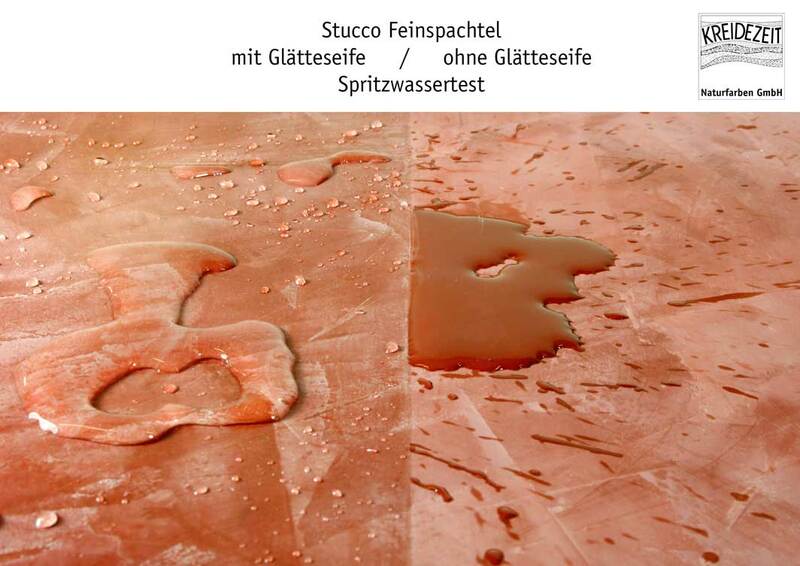 Protective finishing treatment, especially for KREIDEZEIT Stuccolustro, Stucco Fine, Tadelakt and Marmorino. Care for Tadelakt in wet areas. Made of pure olive soap. 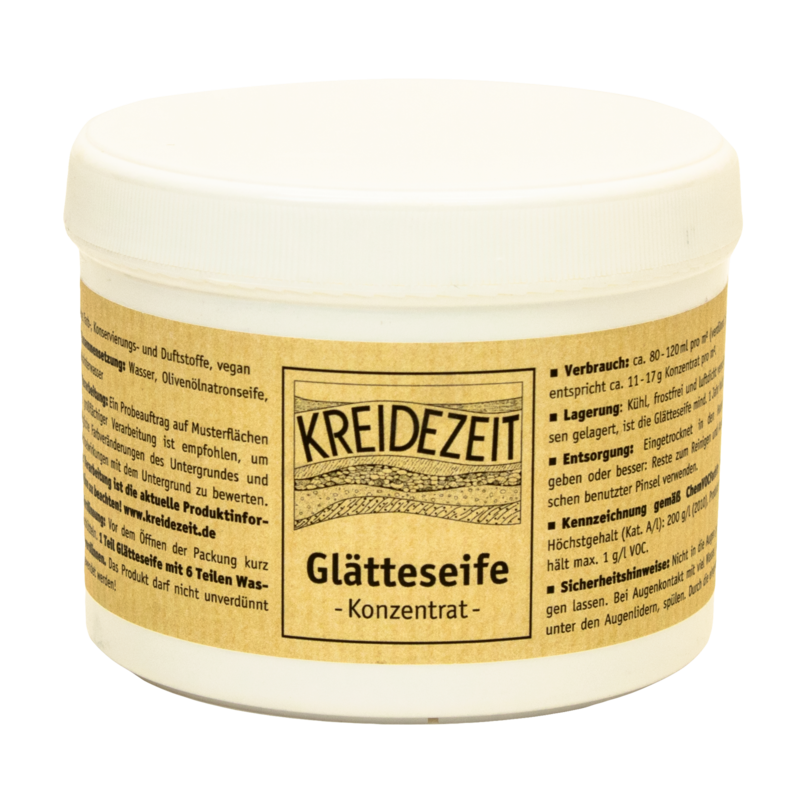 Polishing soap serves as a protective finishing treatment, especially for KREIDEZEIT Stuccolustro, Stucco Fine, Tadelakt and Marmorino. Also suitable as a finishing treatment for matt surfaces such as KREIDEZEIT Lime wall Finishes and Lime Paints. The most important component of Polishing Soap is Corfu Soap, a pure olive soap produced in a factory on the Greek island of Corfu. Without any added colouring, preservatives and fragrances. Gently dissolved in water and applied to sufficiently alkaline lime surfaces, part of the natural soap is transformed into so-called lime soaps, which give the wall surface moisture- and dirt-repellent properties (hydrophobizing) without impairing its diffusivity. When using the product, the complete Productinformation must be observed. Shake briefly before opening the container. Dilute 1 part Polishing Soap with 6 parts water. The product must not be used undiluted! On larger surfaces, the Polishing Soap is applied in sections of approx. 1 m² and then pressed with the trowel immediately or after a short absorption period. Smoothing soap should not dry without subsequent treatment. Dry the last coat of Stuccolustro or Stucco Fine until it has become strong against impact, but do not let it dry out. Then apply the Polishing Soap evenly with a soft brush and press it with the trowel. Wipe off any excess soap from the tool. When Marmorino gets shiny due to densification, is the right time to apply Polishing Soap. Processing otherwise as with Stucco Fine / Stuccolustro. The Polishing Soap is applied shortly after finishing the polishing of the second Tadelakt layer. The Tadelakt should be strong agains impact, but not yet completely dried. Apply evenly with a soft brush. Let set a short while, then polish with the stone until uniform shine is achieved. Polishing Soap can also be used to produce gloss on Lime Wall Finish smooth, but to a lower degree than on our other smoothing techniques. Work in the same way as with Marmorino. If no gloss is desired, allow the surface to dry, apply the Polishing Soao as described for matt surfaces. Surfaces that are particularly stressed, especially Tadelakt, are given improved hydrophobicity by repeated treatment with soap. After the first layer of soap has dried completely, but no later than after 2 days, apply the Polishing Soap again. Let set a short time and polish with a plastic foil bale (HDPE). Allow KREIDEZEIT Lime Paints and Lime wall Finishes to dry completely. Apply the Polishing Soap thinly, evenly and quickly from bottom to top with the Facade Brush. If necessary, rub the surface immediately afterwards with a soft cloth without pressure to remove traces of the brush. Do not polish the soaped surface! On tinted lime surfaces, a deepening of the colour or whitish clouds typical for lime soap can occur (try out on a test surface first!). Wash off any dirt with Polishing Soap and a soft cloth or sponge. Then wipe dry with a dry soft cloth. Soaped lime paints and other matt surfaces should only be rubbed very carefully without pressure, otherwise glossy spots may occur.